A number of factors influence the visible signs of aging of the skin, including genetics, environment, and lifestyle. The associated changes are qualitative, quantitative, or both. Qualitative changes involve the quality and texture of the skin itself and include lines, wrinkles, blemishes, scars, and spots. Mild changes can be improved with quality skin care and regular mild chemical peels. More severely damaged skin may require resurfacing procedures such as laser skin resurfacing or more aggressive chemical peels performed by the surgeon. Quantitative changes include excess or redundant skin such as sagging jowls and neck. Surgical tightening procedures such as facelift and neck lift surgery by our experienced plastic surgeon, Dr. Richard Zeff, are often the best treatments for quantitative changes. Facelift surgery is a procedure designed to address quantitative changes in the face related to the natural process of aging, including sagging, excess skin and loose tissue. Facelift surgery, called a rhytidectomy in medical parlance, tightens the folds and deep creases that are caused by skin laxity. During the surgery, skin and tissue are tightened in order to rejuvenate the patient’s appearance without creating an “overcorrected” look. What Areas Does a Facelift Treat? 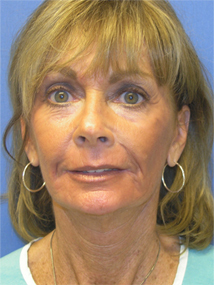 A standard facelift is designed to improve the midface and neck area. More specifically, a facelift addresses the upper, mid, and lower cheek area (including nasolabial folds), the jawline (and jowls), and the neck. Some surgeons distinguish between a mini facelift which addresses primarily the face and to a small extent the upper neck, and a full facelift which addresses both the face and neck. However, a facelift alone will not add fullness to hollowed out areas or smooth fine lines. By adding fat grafting, cosmetic injectables, and non-surgical therapies, these common concerns can also be addressed. 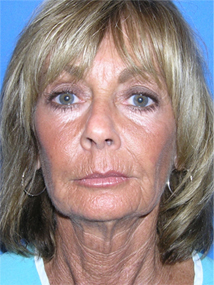 In some cases, a mini facelift may be more suitable to the needs and goals of the patient. A mini facelift focuses on rejuvenating the lower face and jaw, but this approach is less effective when the neck tissues are very loose or excessive, requiring a full facelift. A mini facelift is a more conservative treatment than a full facelift and typically results in shorter scars. That said, our experienced plastic surgeon endeavors to reduce the visibility of scars in all procedures. 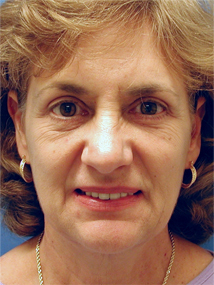 Who Is a Good Candidate for Facelift Surgery? It’s important to have a thorough evaluation performed to determine if facelift surgery is right for you. In some cases, a less aggressive or non-surgical treatment may be appropriate for what you would like to achieve. During this initial consultation, we will also confirm that you are in good general health, have reasonable expectations for the outcome, and understand what to expect during each stage of the process. If you have good skin elasticity, strong underlying bone structure, and sagging skin and muscle on the mid and lower face, a facelift may be able to help you restore your appearance beautifully. What Happens During the Facelift Procedure? A full facelift is performed under anesthesia, the type of which will be discussed during the initial consultation, as an outpatient procedure. Incisions are made in the temples and around the ears, occasionally with a small incision under the chin. Through these incisions, the skin is tightened up and back, often in two planes: a muscle layer and a skin layer. Excess skin will be trimmed, as needed, to achieve the desired outcome. The result is designed to be natural-looking rejuvenation without looking too tight or overcorrected. Some patients choose to combine facelift surgery with other procedures, such as eyelid surgery or brow lift, for more comprehensive effects. Dr. Zeff will discuss these options with you at the consultation. How Can Facial Fat Injections Improve My Results? An important part of a facelift procedure may include taking a small amount of fat from one part of your body and injecting it into areas of your face that have lost volume in order to restore a more youthful appearance. This is called fat transfer, and liposuction is used to harvest your own fatty tissue to be repurposed as a volumizing filler. Dr. Zeff will go over this option with you at the consultation. We encourage patients to take their time healing and enjoy the opportunity to relax as much as possible. Facelift surgery is typically an outpatient procedure, so you should be able to return home the same day. We will provide medication to manage any pain, and we can offer tips to make your recovery easier and more pleasant. Numbness of the skin after facelift surgery is common and temporary, and nerve or muscle damage is extremely rare. Although usually minimal, any black and blue from bruising generally settles in the lower part of the face and neck. Some post-operative swelling is normal. Patients can generally go out in public after one week and look quite presentable in two to three. What Will My Facelift Scars Look Like? Part of achieving exceptional results is minimizing signs of surgery, including scars. Our experienced surgeon takes great care to place the incisions discreetly and facilitate the best possible healing experience. Most patients find that, once fully healed, the marks are virtually unnoticeable. Everyone recovers differently, and we will monitor your progress to ensure the optimal outcome. Additionally, we offer resurfacing procedures such as chemical peels and laser skin resurfacing. We will explain all of your options during your initial consultation. We custom-design each surgical plan to optimize the outcome for the individual patient. A facelift at our practice, including the surgeon’s fee and anesthesiology fee, is $9,200. 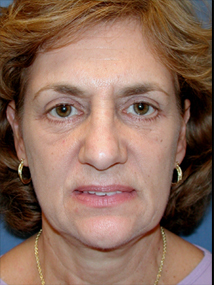 The less aggressive mini facelift, which is performed in the office under local anesthesia, costs $6,500. Other factors unique to your treatment plan could alter your total treatment price. We understand that cost is an important part of your decision-making process, which is why we provide a detailed estimate during your initial consultation, including the anticipated fees for anesthesiology and the hospital or medical facility. For this reason, Dr. Zeff will provide the total cost of your surgery, so there will be no surprises. Additionally, we work with several reputable lending agencies in the event you would like to consider plastic surgery financing. What Are Non-Surgical Alternatives to a Facelift? Popularly called a Liquid Facelift, utilizing a combination of cosmetic injectables and dermal fillers can address a wide range of common signs of aging. A Liquid Facelift can smooth fine lines and creases, restore volume to cheeks, lip lines, and temples, and breakdown fatty tissue along the chin. However, this technique cannot eliminate sagging skin. A facelift can tighten and tone the skin to some degree, but if that is your primary concern, laser skin treatments may be ideal for enhancing skin tone and texture. We offer a wide range of advanced laser modalities that can firm, smooth, and rejuvenate the appearance of the face from deeper foundations up—all without surgery. Chemical peels, microdermabrasion, PRP therapy, micro-needling, and other skin care treatments remain highly effective ways to rejuvenate the face if your concerns are mild to moderate and don’t affect the deeper tissues. We can help you identify which methods are appropriate for your skin tone, type, and color. We are proud to serve as a SkinCeuticals Aesthetic Center. This state-of-the-art line of medical-grade skin care products provides patients with science-backed treatments they can apply at home. Regardless of your concern (signs of aging, luminosity, rehydration, acne, discoloration, etc. ), SkinCeuticals has an innovative and effective topical solution. Our extensively-trained team can guide you selecting the right formulas for your needs, goals, and lifestyle. Q: What does a facelift do? A: A facelift lifts and tightens the sagging areas of the cheeks and neck due to loose or extra skin. It does not, however, remove all of the very fine lines or wrinkles that are the result of weathering and years of sun exposure. These can be improved by chemical peel or laser skin resurfacing. Q: Where are facelift incisions placed? A: Facelift incisions are placed in the temples in front of and behind the ears. In some cases, a small incision is made under the chin. The hair does not need to be cut and many hairstyles effectively conceal facelift scars. Q: What results can I expect from a facelift? A: Dr. Zeff works with each patient to develop a personalized treatment plan that is suited to individual needs and goals. Although each patient’s results are different, our fundamental commitment to safety and satisfaction helps create exceptional outcomes. For facelift patients, this means achieving a natural-looking rejuvenation for a more rested and youthful overall appearance. During your facelift consultation our plastic surgeon can answer any other question you may have about the procedure or recovery time. Please contact our practice to schedule an initial consultation for facelift surgery.